As the Craftivist Collective we love to showcase fellow craft-lovers who inspire us to keep crafting, teach us new craft skills & new ways of thinking and challenge us in how craft can be done, seen & have a positive mark on the world. These people keep me and the Craftivist Collective moving forward and growing and basically I have a big Craft Crush on them for that reason & want to celebrate their crafty brilliance with you so you can be inspired by them too. Craft Crush #7 is…. Zoe Robinson! What do you do? I am founder and editor of The Good Wardrobe, an online community hub mixing the best ‘conscious fashion’ with services that prolong the life of clothes. We have a ‘long-life style’ directory that lists everything from cobblers to sewing classes; organic jean brands to online haberdashers. The forum allows you to ask advice or share knowledge, and the blog celebrates sustainable style. I also freelance on a number of projects including the forthcoming Streatham Food Festival which has a big sustainable focus – I’m currently writing the brochure. And I’m one of the organisers of The Little big Peace Event, a week-long South London festival which celebrates Peace Day on 21st September. What are your first memories of crafting? Embroidering flowers, probably aged around 7. My sister reminded me recently that our Nanna used to get us to make edible fruit decorations for her using marzipan and food colouring. What inspires you? People who are passionate about making a positive difference, or who see a problem and want to find a way to solve it. My first mentor Kresse Wesling (founder of Elvis and Kresse) discovered how many tonnes of firehose went into landfill each year and made it her mission to find a way to upcycle it. She didn’t see it as waste – she saw it as a durable, interesting material with great potential and just needed to find the right use for it. She has just moved house and is currently making a bedframe using wooden gym equipment removed from a local school. She inspires me to think big. Who do you have a craft crush on? Aside from Kresse, there are so many. Juliette Stuart, founder of Only Denim is a demon mender and is so creative – she does everything by hand and creates beautiful pieces from off-cuts and scraps. Tom Van Deijnan aka Tom of Holland works magic with a darning mushroom and John-Paul Flintoff ‘s crafty exploits are always a delight, from the octopus he made his daughter out of her old tights, to the pants he crocheted out of hemp and the amazing jeans he taught himself to make! Finally, Emily who interns at The Good Wardrobe who created our wonderful Sew It Forward banner – she is so imaginative and uses her skills and love of upcycling to make incredibly thoughtful gifts with such attention to detail. Oh, and my husband Ben who, when we were invited to a friend’s Hawaiian themed party, made us ‘grass’ skirts out of old copies of TimeOut magazine. Charity Shops and second-hand shops: I love hunting for treasures and buy most of my clothes second hand. Food: I really do like my food and have to eat regularly. How has craft been a positive influence for you, your community or society at large? Making stuff calms my mind – it takes me out of my busy head and makes me focus on the moment and the task in hand. It also brings me a huge sense of achievement – I got married in April and was let down by the dress-maker three weeks before the wedding. Instead of panicking and running out to the high street to find three bridesmaid dresses, I made them (with a little help from Emily). It was a slightly mad thing to do – I hadn’t done any dress-making since school and I was finishing the flower on one dress the morning of my wedding – but I made a pact with myself that I wouldn’t get stressed and in the end I felt so satisfied. In my community we have a number of craft groups who get involved in various festivals. 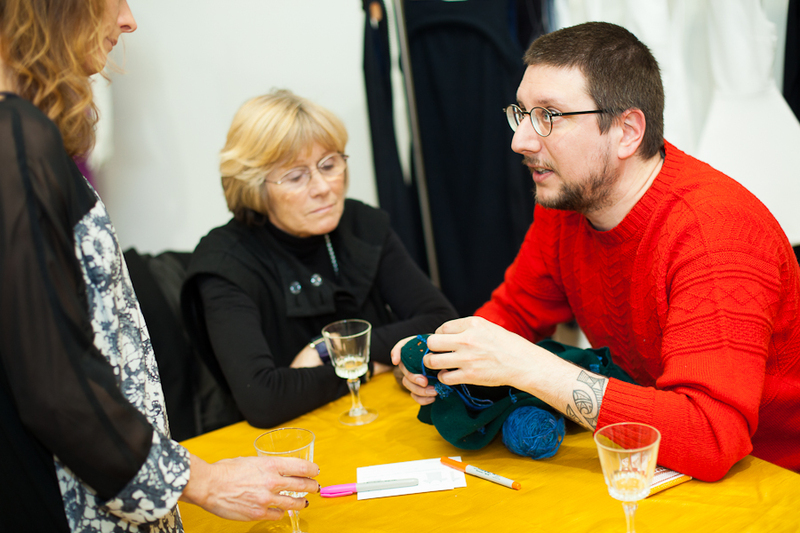 The Streatham Ninja Knitters cheer up the streets every so often with their woollen wonders – it creates a talking point, brings people together and inspires others to be creative too. 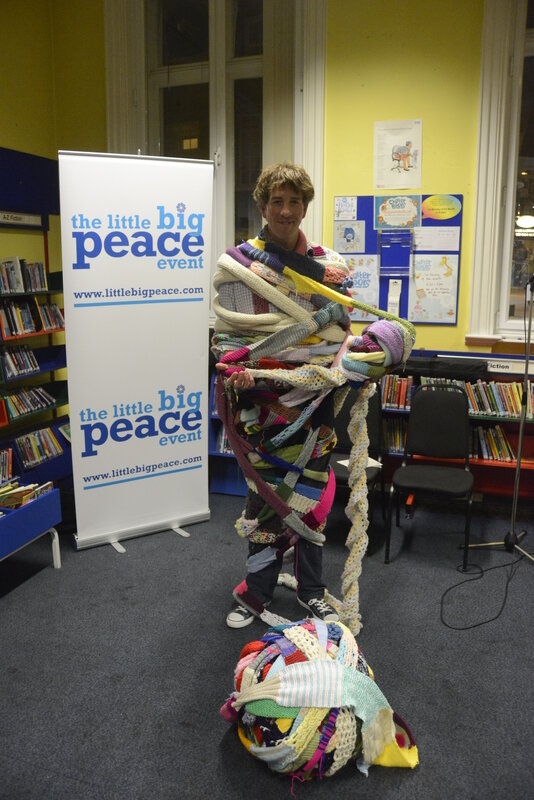 They even knitted us a 100m long scarf for the Little Big Peace Event last year – it became our mascot and was a great way to connect with the public at our launch event on Streatham High Road. At The Good Wardrobe our Sew It Forward initiative encourages people to share their sewing, knitting and mending skills. It’s not only those learning skills at our events who find real pleasure in taking part – those sharing skills often find they had, to that point, taken theirs for granted. They suddenly have a newfound awareness of what they have to offer. There is of course a huge social benefit too of making things together by sharing time, knowledge and skill. If you could change one thing about the world, what would it be? For people to consume and waste less – to buy less, buy more consciously, buy more second-hand items, respect things by looking after and mending them and dispose of things considerately so that someone else can use what they don’t need. Have you got any words of encouragement for our readers about the power of crafts? Just have a go. Try things out, go to some classes (we have listings on the site), or ask someone you know to teach you. You may be surprised at how many people want to offer help. I know someone who could cook but couldn’t sew, and she swapped a meal for a sewing lesson. If you need some advice, join our site and ask our community on the forum. The first thing you try may not suit you – some people like knitting but not crochet. When I first tried to darn, it was a disaster but then I organised a class with Tom of Holland and now I am quite obsessed with mending holes in knitwear. And if you don’t have the right equipment, then improvise – my darning mushroom is too small for some holes so I use our soup ladle!